I simply cannot believe I have been home from Malawi for a week already. Time flies! I prepared a few menus before I left on that trip, but those have all run out and it’s time to get planning again! As always, THANK YOU for sharing your menus! Keep it coming! For the second month in a row I have come in under my goal for our grocery budget. I told my husband I am waiting for a meat sale, which is true, but that means we are having some ‘regulars’ to the menu more. At first, a few of these recipes were difficult. After a while, though, I know what to expect an how to do it more efficiently. congrats on the budget success – that is great!! Mon – Memorial Day BBQ at my house & pool. We are supplying the hamburgers & hot dogs, everyone else is bring the sides, desserts and drinks. Sunday: BBQ at our house…so much food! 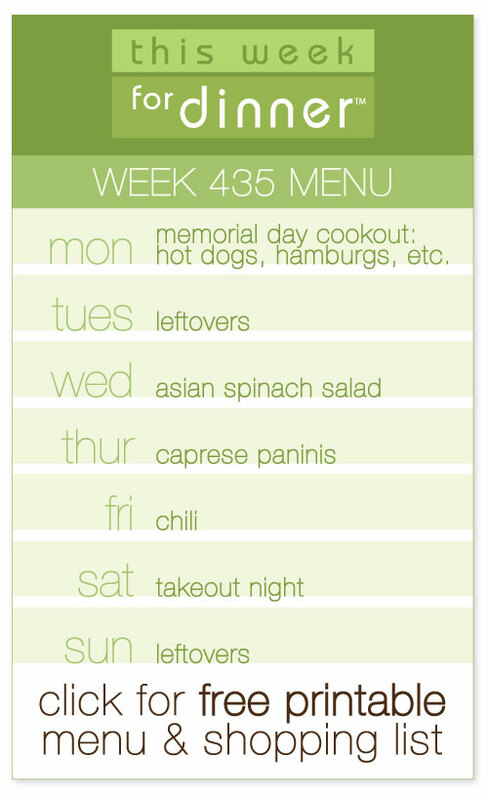 You’ll see it all in the meals for the rest of the week. Saturday: Have I lost it completely? Hosting another BBQ for friends, so prepare for a similar menu next week! I know, I think everyone is ready for summer!! Wednesday – out – 5:30 appt. have fun with the new grill! glad you’re back – and falling off the bandwagon is perfectly fine, life happens! as always, thank you all for your great menus!! !